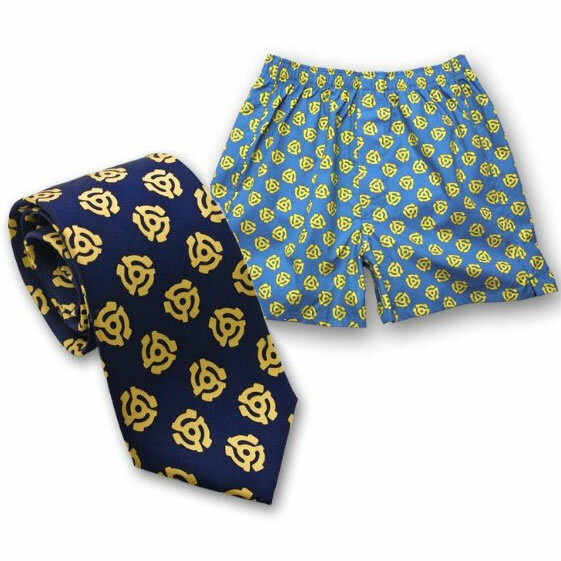 To celebrate a 50th birthday in style, we've selected two evocative patterns from Josh Bach's exclusive collection of handcrafted ties and boxer shorts. Each combines a dash of nostalgia with a big helping of cool. For the music lover, 45 RPM Record Adapters are sure to bring back pleasant memories. For the baseball lover, blueprints of iconic stadiums create an elegant and eye-catching motif. Sold as a set, they're the perfect gift for the 50-year-old who's a fan inside and out! Josh Bach accessories are manufactured in the heart of New York City. Ties are 100% silk, handcrafted to 56" L X 3-3/4" W, packaged in a nifty gift tube. Boxer shorts are 100% pure cotton, packaged in an old-fashioned box. Medium = 34-36", Large = 36-38"